NAME: GP LIMITE ANDAMUR S.L. REGISTERED OFFCIE: POL. IND. SAPRELORCA, CENTRO DE NEGOCIOS ANDAMUR, 30817 LORCA (MURCIA) SPAIN. That hereinafter shall be referred to as “the company”. Browsing the website of the company confers user status and implies full and unreserved acceptance of each and every one of the provisions included in this disclaimer, which may be subject to modifications. The user undertakes to make proper use of the website in accordance with legislation, good faith, public order, traffic uses and this disclaimer. The user shall be held liable to the company or to a third party for any damages that may be caused as a result of failure to comply with said obligation. CONDITIONS OF ACCESS AND USE. Access to the website and its services is free and open. However, the company requires the relevant form to be filled out before some of the services offered can be used. The user guarantees that all data provided to the company are true and up-to-date and shall be solely responsible for any false or inaccurate statements made. Spread content which is criminal, violent, pornographic, racist, xenophobic, offensive, justifying terrorism or, in general, contrary to law or public policy. Enter any computer virus or conduct any actions which may alter, damage, interrupt or generate errors or damage to electronic documents, data or hardware and software systems of the company, or of a third party; and hinder access by other users to the website and its services through mass consumption of the computing resources through which the company provides its services. Try to access the e-mail accounts of other users or restricted computer systems of the company or of a third party and extract information, if appropriate. Infringe intellectual or industrial property and violate the confidentiality of the information of the company or of a third party. Impersonate another user, the administration or a third party. Reproduce, copy, distribute, make available or otherwise publicly communicate, transform or modify the contents, unless permission is obtained from the copyright holder or it is legally permitted. Collect data for advertising in order to send any kind of publicity and communications for the purpose of sale or other of a commercial nature without any prior request or consent. All website content, including text, photographs, graphs, images, icons, technology, software, as well as its graphic design and source codes are works which belong to the relevant holders, and none of the exploitation rights can be understood as granted to the user beyond what is necessary for the correct use of the website. In short, users accessing this website may view the contents and carry out, if appropriate, authorised private copies provided that the elements reproduced are not given to third parties or installed on servers connected to networks, or undergo any kind of exploitation. Additionally, all trademarks, trade names or logos of any kind that appear on the website are the property of their relevant owners, and use or access to them does not confer the user any rights over the latter. Distribution, modification, assignment or public communication of the contents and any other act that has not been expressly authorised by the holder of the rights of exploitation are prohibited. The establishment of a hyperlink does not imply in any case the existence of relations between the company and the owner of the website on which it is established, nor the acceptance and approval by the company of its contents or services. Those who intend to establish a hyperlink must request prior written authorization from the company. In any case, the hyperlink will only allow access to the homepage of our website; similarly, users must also refrain from making false or inaccurate statements or notes about the company, or including illegal contents, contrary to good practices and public policy. The company is not responsible for the use of the materials made available on this website or any actions based on it by the user. The content of this website is general in nature and is for informational purposes only and as such access to all the contents, or its completeness, correctness, validity or currency, or suitability or fitness for a particular purpose is not fully guaranteed. The inability of access to the website or the lack of veracity, accuracy, completeness and/or timeliness of the content, as well as the existence of faults and defects of any kind of content transmitted, distributed, stored, made available or accessed through the website or the services offered. The presence of viruses or other malware elements in the contents that may cause alterations in the computer system, electronic documents or user data. Failure to comply with the laws, good faith, public order, traffic uses and this disclaimer as a result of misuse of the website. In particular, by way of example, the company is not responsible for the actions of third parties that violate the rights of intellectual and industrial property, rights of honour, personal and family privacy and image. Moreover, the company declines any responsibility for the information found outside this website and not managed directly by our web master. The purpose of the links contained on this website is solely to inform the user about the existence of other sources likely to expand the contents offered by this website. PROCEDURE WHEN UNLAWFUL ACTIVITIES HAVE BEEN CONDUCTED. 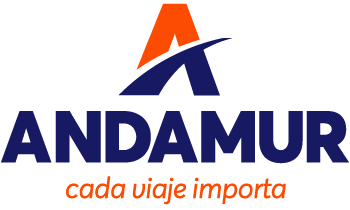 If any user or third party considers there are facts or circumstances demonstrating the illegal use of any content and/or any illegal activity having taken place on the web pages included or accessible through the web site www.andamur.com, they must send notification to info@andamur.com duly identifying themselves, specifying the alleged violations and specifically stating that under their responsibility the information provided in the notification is accurate. For any legal matters with regards to the website of the company, Spanish law will apply with the Courts and Tribunals of the city of the company being competent to resolve any conflict. All notifications and communications among users shall be considered effective, to all intents and purposes, when they are carried out by postal mail, e-mail or telephone. Users must communicate with the company via any of the means of contact mentioned at the beginning of this disclaimer. This disclaimer was last reviewed in May 2018; therefore there might be some variations until its next review.